CLIFTON – For the first month of the season Clifton was the biggest surprise in North Jersey. The Mustangs won their first 10 games and 14 of their first 15, but consecutive losses to Union City and Bergen Tech brought them back down to earth. 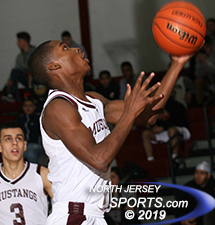 Despite an impressive record thus far, the Mustangs looked to hit the reset button with the Passaic County Tournament already underway and the North 1, Group 4 state sectional tournament right around the corner. That would not come easy against a red-hot West Milford team that came into Clifton on a six-game win streak. It was all hands on deck as Clifton needed contributions from everyone to pull out the victory. Jack Louer scored a go-ahead layup and Eddie Perez added four of his career-high 20 points in the final minute as the Mustangs held on for a 55-51 win over West Milford on Thursday afternoon at Clifton High School. “We needed a win like this where everybody came ready to play and everyone stepped up,” said Clifton head coach Michael Cadmus. Both teams struggled to get into an offensive flow throughout the first half. Clifton’s backcourt of Armani Brinson and Wendell Abellard both picked up their second fouls early in the second quarter but the Highlanders were unable to capitalize. Eddie Perez scored six quick points late in the second quarter as Clifton grabbed a 24-17 lead at the half. Josiah Basket scored 17 of his game-high 22 points in the fourth quarter for West Milford, which fell to 10-5 on the season. 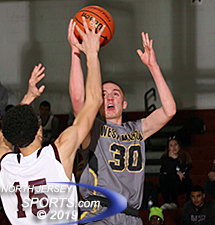 West Milford took its first lead since the game’s opening moments on a free-throw by Kevin DeRaffele but Perez answered back with a bucket inside and a pair of free-throws to put Clifton back in front heading into the fourth quarter, 36-32. It looked like Clifton was ready to deliver the knockout blow when Lazar Jovanovich made a steal near midcourt and threw down a one-handed dunk to bump the lead back up to seven. However, just five seconds later that momentum came to a halt when Brinson picked up his fourth foul. After holding West Milford sniper Josiah Basket in check for 3-plus quarters Brinson could not be as aggressive defensively and that was all Basket needed to get on track. On the Highlanders’ next two possessions Basket scored on drives to the basket to make it a one-possession game. Then in a span of 20 seconds late in the fourth quarter, the momentum swung completely in the Highlanders’ favor. A scramble for a loose ball led to Basket knocking down a wide-open 3 to knot the score at 46. On the ensuing possession, West Milford guard Dan DiMinno drew a charging foul on Brinson that fouled him out of the game. Just seconds later, Abellard picked up his fifth foul. Already down a starter before the game began the Mustangs had to go deep into the bench in crunch time. Jhamir Harrison split a double-team at the foul line and made a nice dish off to Louer for the go-ahead bucket 1:15 to play. The Mustangs got a defensive stop and Perez came up big again, just as did all game long. His layup put the Mustangs up four but the West Milford refused to go away quietly. After a two offensive rebounds to maintain possession Basket drilled a three from the top of the key to slice the lead to 52-51 with 19 seconds left. Clifton bent several times in the fourth quarter but never broke. Perez hit a pair of shots from the charity stripe with 12 seconds left. After a game-tying three-point attempt was off the mark, Kyle Vellis got the rebound and hit a free-throw to ice the game. On top of scoring a career-best 20 points, Perez added 15 rebounds and four blocks for Clifton (15-3). Jovanovich added 14 points and Brinson delivered 12 points, seven rebounds, and seven assists. Basket scored 17 of his game-high 22 points in the fourth quarter for West Milford (10-5). DeRaffele added 16 points and 10 rebounds for the Highlanders, who as the No. 6 seed will face off against 11th seeded Manchester Regional in the Passaic County Tournament’s Round of 16 on Saturday. With the two-game skid now in the rear-view mirror and the bench becoming a productive unit the Mustangs are looking to peak in tournament play.